In the past five years, AI has made some remarkable achievements. Objects can be accurately recognised in images randomly picked from the Internet, and human champions in games of skill and chance such as Go and Texas Hold ‘Em poker have been beaten. Technologies thought impossible only a few years ago, such as automated driving, are now a reality. Impressive as these accomplishments are, they merely skim the surface of the number of challenges currently in need of solutions. Many real problems facing industry and society today remain to be solved and AI and machine learning can, in many instances, play a vital role. Yet figuring out how to apply them to any of these problems may seem daunting, even to the most dedicated professional. 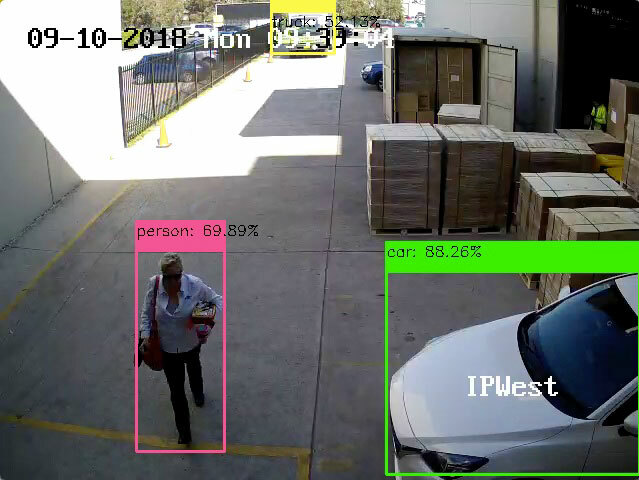 Neuranext Active Security utilises Deep Learning Artificial Intelligence for live feed CCTV identification of anomalous events in real time. Traditional CCTV has been a post hoc evidentiary tool, helping to solve a crime after it has occurred. Active Security makes the camera itself the alarm. 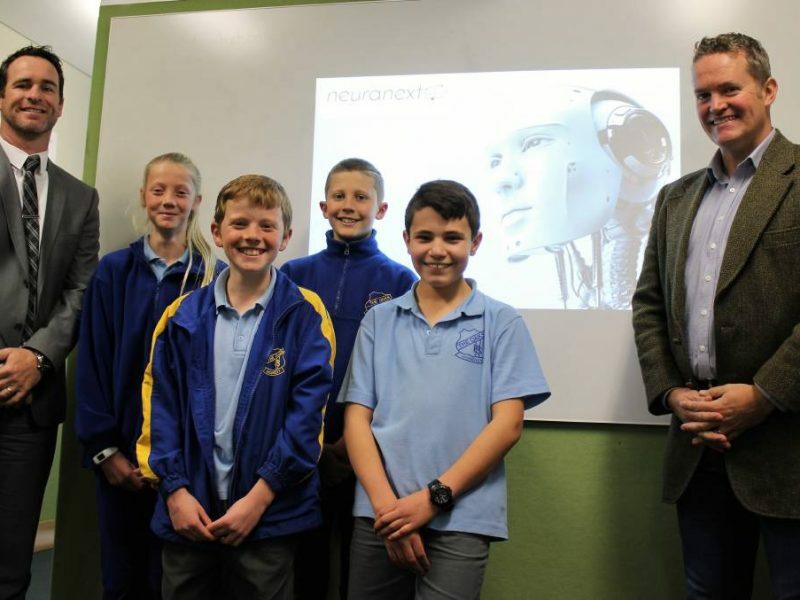 Neuranext’s school incursion program brings Artificial Intelligence to life for students in the classroom. What: Artificial Intelligence in Schools introduces students to the science behind A.I., especially computer vision. Students will implement computer vision A.I. via classification of images of their own handwriting and images they take throughout the school. Students will implement object detection to classify items within pictures they have taken around the school. Students will workshop potential uses of the technology and its implications for the future of work and society. Where: The incursion runs in any space where an Active Panel style interactive board exists. It is preferable to run a days incursion from the one space and have classes rotate through. When: The incursion runs for 50 minutes per group, allowing up to 5 sessions per day. Who: The incursion suits one regular class size per session. The incursion is delivered by a fully qualified NSW DoE teacher with current Working with Children Check and Public Liability Insurance. Investment: The Artificial Intelligence in School’s incursion is $15 inc GST per student. BOOK NOW – email adrian.tyson@neuranext.com to secure your preferred date. Artificial Intelligence in the Future-Focused School. 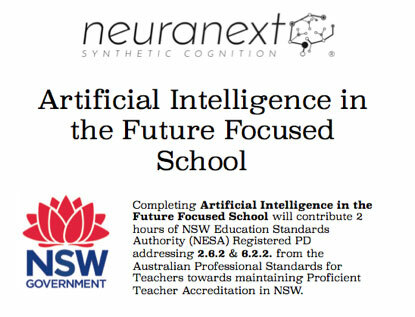 What: Teachers will gain insights and skills to be high quality facilitators of student interaction with Artificial Intelligence technologies using a range of ICT in the classroom including digital cameras, laptops, MNIST numeral categorization dataset and algorithms, Jupyter Notebooks, Python Coding Language, Neuranext’s proprietary Machine Learning AI API for image classification and sound recording equipment. Teachers will learn about and implement advanced neural networks to perform tasks from student-created data. 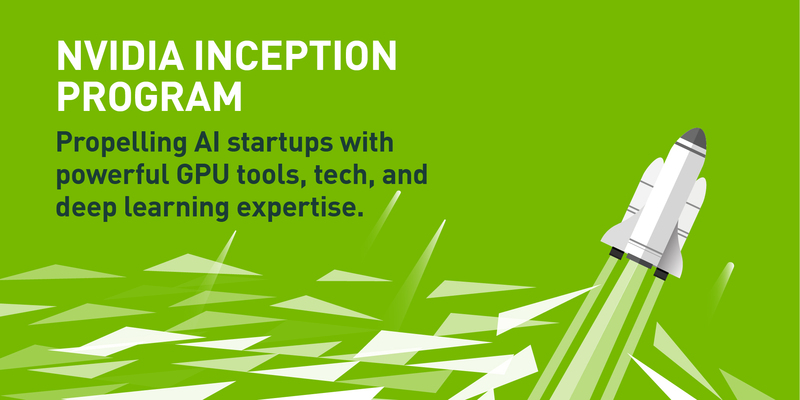 Teachers will participate in implementing image classification from handwriting using the MNIST data training set as well as applying image recognition from the Neuranext API to images captured at the course. Teachers will be able to implement in their classrooms specific examples of AI in use in our everyday lives already, such as face recognition (facebook product), Image matching (Google reverse image search product), natural language processing (Apple Siri Product) as well as Regional Convolutional Neural Networks where items within an image can be recognised (Bounding Box image classification- Neuranext product) – 2.6.2. This course allows teachers to become more skilled in 21st Century future focused Artificial Intelligence technology and tools, addressing 6.2.2. Teachers will be able to incorporate AI and machine learning technology and concepts into their Digital Technology Syllabus programming. Where: The incursion runs in any space where an Active Panel style interactive board exists. When: The incursion runs for 2 hours. Who: The incursion suits teacher groups up to 40. The incursion is delivered by a fully qualified NSW DoE teacher with current Working with Children Check and Public Liability Insurance. Investment: The Artificial Intelligence in School’s incursion is $165 inc GST per teacher. Allow Neuranext to equip your people with the tools to embrace and implement practical applications in your business. Neuranext is led by four skilled professionals with extensive experience in academia, research and commercial operations. Dr Kyngdon earned his PhD in psychometrics and mathematical psychology from Western Sydney University. He was an EAA Post Doctoral Research Fellow at the University of New South Wales before moving to the US to take up the position of Senior Research Scientist at MetaMetrics, Inc., a pioneering edutech company in North Carolina. Upon his return to Australia, he was made an adjunct associate professor of the University of Western Australia. 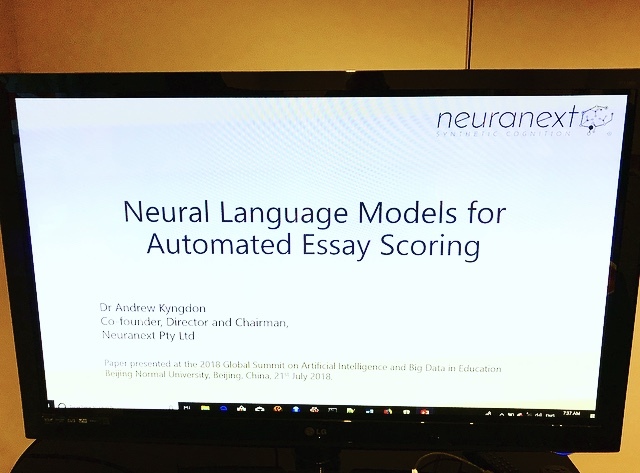 Now based in Sydney, Dr Kyngdon co-founded Neuranext to pursue interests in Artificial Intelligence, particularly in Computer Vision and Natural Language Processing. In August 2017, Dr Kyngdon was an invited keynote speaker at the inaugural Jingshi Conference on Educational Data Mining and Applications at Beijing Normal University, China, where he presented on Long-Term Recurrent Convolutional Neural Networks for Automated Essay Scoring using images of scanned essays. He returns to Beijing in 2018 to conduct an introductory workshop in Artificial Intelligence for the doctoral students of Beijing Normal University. Whilst fluent in both the R and Python programming languages, he prefers to use AI libraries including Caffe, Caffe2, PyTorch and TensorFlow for his work. He regularly attends the Sydney Data Science Breakfast Meetup and other events concerning AI and Data Science. Peter is a Communications professional who has spent almost 20 years working with some of the world’s most valuable blue-chip brands. These include Mercedes-Benz, Ford, Nissan, Infiniti and AkzoNobel. He has helped build the public profiles of some of the biggest multi-national corporations through targeted public relations and by regularly landing media coverage in many large-scale publications. Peter earned his B.A. (Honours) Psychology from Western Sydney University from his research into prison inmates’ reactions to social and spatial density. His mechanical engineering training and qualifications are from the Chisholm Institute in Australia. Adrian has extensive experience in business operations and managing growth across multi-state operations in roles including general manager and financial controller. He managed a decade of double-digit growth to ten million dollars annual revenue in extremely lean economic conditions in the Automotive Aftermarket sector. Clients included Macquarie Bank, Toyota Motor Corp., Mercedes Benz, Crown Forklifts, Renault Australia, NSW Health and the Volkswagen Group. Adrian has successfully managed acquisitions and their integration as well as start-ups in light manufacturing, film services and importing businesses. In the creative space as a screenwriter, producer and director Adrian has twice had short films selected for the Cannes Film Festival Court Metrage section (2014 & 2017) as well as being selected in competition at the Academy Award qualifying St Kilda Film Festival (2018). Adrian earned his B.A. Psychology & Master of Teaching from Western Sydney University. Daniel has delivered twenty years of excellent information technology practice, including ten years of focused electronic and data security consulting. Employing a practical and efficient Project Management approach when meeting enterprise technical challenges, Daniel demonstrates a resolute dedication to the creative and accessible delivery of secure and valuable human-to-machine solutions. Daniel has previously successfully delivered people-security screening solutions to major infrastructure sites, efficiently integrating multiple non-technical and technical stakeholder requirements into efficient deliverables. Daniel is a technologist at heart, who is passionate about educating and assisting creative problem-solving practices, through working at a deeply human level both with teams, and individuals. 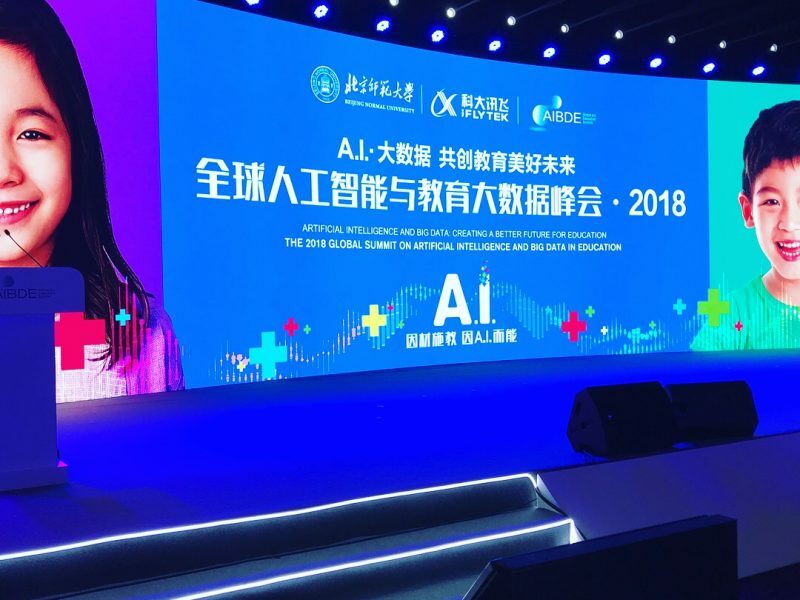 Neuranext Chairman Dr. Andrew Kyngdon delivers paper at the 2018 Global Summit on Artificial Intelligence and Big Data in Education in Beijing, China. © 2019 Neuranext All Rights Reserved.